The new explosion proof and flameproof Model LP35 from BEI Sensors is the first low profile hollow shaft encoder that features a slim 2.01 inch profile and is designed to meet UL, ATEX, and IECEx standards allowing for operation directly in Division 1, Zone 1 environments. The new explosion proof and flameproof Model LP35 from BEI Sensors is the first low profile hollow shaft encoder that features a slim 2.01 inch profile and is designed to meet UL, ATEX, and IECEx standards allowing for operation directly in Division 1, Zone 1 environments. Many oil and gas applications are subjected to extreme conditions where ignitable concentrations of flammable substances are likely to exist under normal working conditions and where space is limited. Using ultra-rugged and reliable products that are designed to meet the high standards required for use in these potentially explosive environments is crucial for running cost effective drilling operations. Business Development and Marketing Manager, Scott Orlosky, gives a sense of the current volatile oil and gas market when he states, “In an industry where fluctuations in supply and demand can drastically effect drilling operations, the need to design more streamlined feedback systems is greater than ever.” BEI Sensors truly understands this need and has engineered the new LP35 incremental encoder to fit into space-restricted applications with the thinnest possible explosion proof hollow shaft design, saving on size without sacrificing performance. To simplify installation and minimize time spent in the field, the encoder features a standard removable terminal box and eliminates the need for an additional intrinsic safety barrier. The explosion proof LP35 is specially designed for oil and gas applications such as top drives, which can be as big as a pick-up truck, yet have surprisingly little space to install speed-sensing devices like encoders. The aim is to keep the overall size of the top drive as compact as possible and this is where the industry’s lowest profile explosion proof incremental encoder comes to the rescue. With a maximum profile of only 2.01 inches (51 mm), the LP35 takes up less shaft space than any Division 1, Zone 1 hollow shaft encoder on the market today. As the motive force behind the drill string, top drives are subject to plenty of shock and vibration while the drill bit cuts into the various rock strata during the drilling operation. The vibration resistant LP35 product is built to withstand up to 250G, making it tough enough to reliably operate in harsh drilling applications, day in and day out. Encoders in these applications are also often installed behind drive motors in close proximity to the motor brake, both of which generate a substantial amount of heat during operation. The LP35 is ready to take the heat, and maintains high performance in temperatures up to +85°C (185°F). 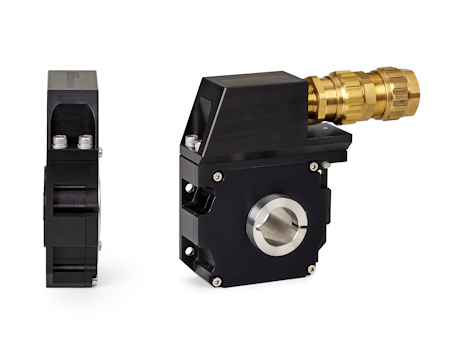 Additional oil and gas applications such as draw works and mud pumps that require ultra-rugged feedback components can also benefit from the LP35’s hard-anodized housing and IP66 level of sealing, which ultimately reduces downtime. In particular mud pump applications where the pumps are situated back-to-back, the low profile design allows space for installing a feedback device. The encoder’s unique terminal box configuration allows the unit to be pre-wired, reducing wiring errors and saving time on installation. Let BEI Sensors help you run the most cost effective and highest producing oil and gas operations with encoder products that are designed to fit, perform and last in these extreme and space-restricted applications. For more information on the explosion proof and flameproof LP35 incremental encoder, visit www.beisensors.com/lp35ex.